Apu Ollantay is a unique artefact. It is the only drama / play script which was written in Quechua and which claims to be of Inca origin. That claim is disputed. Reading it in English makes for a curious and not always comfortable experience. You can download a version for free through Project Gutenberg - and that is the version I read and link to. "In 1878 Gavino Pacheco Zegarra published his version of Ollantay, with a free translation in French. His text is a manuscript of the drama which he found in his uncle's library. Zegarra, as a native of Peru whose language was Quichua, had great advantages. He was a very severe, and often unfair, critic of his predecessors. In the present translation I believe that I have always preserved the sense of the original, without necessarily binding myself to the words." Still, reading the snide asides about the "difficult and intolerably tiresome" text produced by the only native scholar (& Quechua speaker) and the whining about how "severe and often unfair" his criticism of the efforts of non-native scholars were, while acknowledging that his criticisms were broadly correct... it's hard not to see this as pretty staggering entitlement and arrogance on behalf of Sir Clements Markham (the scholar who wrote this translation). It's also a bit rich that he almost complains about Zegarra having a "great advantage" due to being a native Peruvian & Quechua speaker. The end result is that I wish Zegarra had written an English translation, or that my own French was serviceable enough to seek out his work and read that instead of this one. So: the framing makes me distrust this version of the text a bit. Being a loose translation is fair, so long as there is loyalty not just to form, but also to substance. A loose translation written with some colonial arrogance thrown in? It undermines my trust in the authenticity of the text. Spanish conquistadors reached the Inca in the 1530s. The first written text of Apu Ollantay was put on paper in 1770. The Markham text was written in 1910. So 240 years passed between the conquest and the time when the play was written down for the first time, and another 140 before this translation was produced. A lot happened to the Inca and their descendants in those 240 years. But complete Inca dramas were also preserved in the memories of members of the Amauta caste and, until the rebellion of 1781, they were acted. (...) Taking the name of his maternal ancestor, the Inca Tupac Amaru, the ill-fated Condorcanqui rose in rebellion, was defeated, taken, and put to death under torture, in the great square of Cuzco. In the monstrous sentence 'the representation of dramas as well as all other festivals which the Indians celebrate in memory of their Incas' was prohibited. This is a clear proof that before 1781 these Quichua dramas were acted." Despite his claims, I am aware that there is an oft-quoted stance taken by academics studying the Selk'nam people of Patagonia that those were the only native peoples with a pre-conquest history of drama, in the shape of their Hain rites of passage. 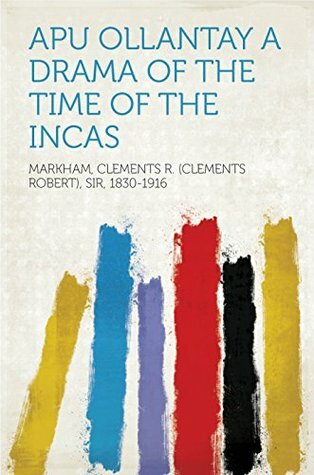 Assuming that academics studying the Selk'nam were not completely ignorant of the work academics studying the Inca had produced, this suggests that the historicity of Incan drama can't have been universally accepted by scholars. Did the Inca perform plays? And was Apu Ollantay an Inca play? Did people pass on Inca dramas in oral history within one caste / family for hundreds of years, ready to be recorded at last by Western & priestly scholars with a sudden interest in recording such things? And is the resulting record authentic to pre-conquest Inca dramatic lore? After reading the play, I think that, whatever the kernels of its original seed, it must have undergone a lot of adaptation in the hundreds of years under Spanish rule. From things as simple as having a scythe as a symbol of death (even though the Inca had a scythe, I doubt it had the same symbolism), to casting the founder of the Inca empire and venerated Inca hero as the villain of the piece, the text feels like most of it was meant to appeal to post-conquest society. I have no doubt that there were performative arts in Inca times - storytellers, songs, festivals, rituals - and I can imagine staged plays being part of that, too. But reading an English text written in 1910 by a British scholar based on texts recorded in 1770... that text did not feel like it was part of a pre-conquest canon of plays, not to my eyes. Big general Ollantay is in love with princess & daughter of his king. The king's law decrees that royals may only marry each other. General & princess have married in secret. The general asks the king for his blessing, is refused, and plans a rebellion & conquest, but by the time he is ready to do this, the king has taken his court elsewhere. Ten years later, and the civil war caused by the general's uprising is still in progress. The princess had a daughter, who lives in a temple of sacred virgins and is sad about being alone and locked up. Also, she hears mournful cries at night. King dies. Little girl discovers that the mournful crying comes from her mother, who is locked up in a dungeon below the temple. New king sends out his general to conquer the rebels once and for all, which he does by acting as a trojan horse. When the rebel general is brought to the new king to face justice, he is suddenly offered mercy and permanent rule over a province of his own. Then, the little girl storms the palace and pleads for her mother's life, so the king (and all present) go to investigate, discover the locked-away princess in the dungeon, and everyone lives happily ever after. I felt that the plot was very thin. I do wonder whether my impression would be different if I saw the play performed on stage: reading scripts can sometimes feel a lot flatter than seeing them performed. The tone of the Markham text feels a bit faux-Shakespearian (hence my comparison to Romeo & Juliet and Coriolanus). The author makes choices about which Quechua names and words to use, and which to translate, but these choices are to the detriment of the text when characters make a lot of puns that are now broken. (One character has a name that includes the Quechua word for "rock" or "stone", so there is a lot of talk about stones and rocks whenever he is around. Only the footnotes make clear that these are puns. Another character is called "joyous star" in Quechua, so when others ask her where the joy has gone, or refer to her as "the star", then the text again relies on footnotes to clarify the meanings). There are references to locations, plants, animals, and some customs which are Inca. At the same time, the court, the generals, the temple of virgins... those things don't seem very different from tropes in Western drama. Incan religion is laid on very, very thin, if at all. If the play was not originally conceived in post-conquest times, then it seems very likely that it was toned down to avoid persecution by the zealot Catholics in charge for hundreds of years. The end result is a play that, in its English translation, could just as well be a play about any other old civilisation. Egyptians, Romans, Greeks, Macedonians, Ottomans. Is it the act of translation itself which causes this feeling - of a story dipped in Inca decorations for flavour, rather than an Inca story? Or is it the fact that, whatever kernel of Ollantay's story had been the root of this play, it probably took on influences by the conquerors and their cultural traditions (or rather, was it heavily edited and amended over time because of prevalent persecution)? I don't know. All in all, I would buy a ticket and see this play performed on stage, to see if it feels differently that way. I would love to see it in Quechua, with English subtitles or surtitles. However, on paper / screen, the text is an interesting curiosity, but not quite the immersive dive into Incan culture I had hoped for.